SHANGHAI—Zong Yi, a Chinese businessman with asthma and worries about his country's pollution problems, happily took delivery of his new electric Tesla Model S sedan in May. His problem: How to get it home. Mr. Zong lives in the southern Chinese boomtown of Guangzhou, where he founded a business that makes energy-efficient equipment like water heaters for swimming pools. 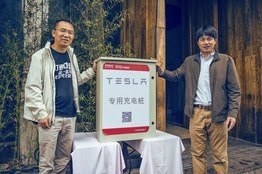 In April, Tesla Motors Inc. delivered its first cars to customers in China in Beijing, about 1,300 miles to the north. Tesla doesn't operate enough charging facilities between the cities to allow him to drive his car home. Undaunted, Mr. Zong decided to build his own charging network. With the help of partners found online, he bought 20 charging pillars from Tesla for 5,000 yuan (about $800) each and put them in 16 cities along the way. "I thought it would be cool if I could build China's first electric-car-charging road," said Mr. Zong, who completed the installations last month. A Tesla spokeswoman said the company is aware of, and approves of, Mr. Zong's ambitions. Mr. Zong's do-it-yourself approach illustrates a major challenge faced by Tesla and other electric-car makers targeting China. China's government wants 500,000 gasoline-electric hybrid and all-electric vehicles on its roads by next year and five million by 2020 as part of its effort to improve air quality and reduce oil dependence. But only about 17,600 such vehicles were purchased in China last year, according to the China Association of Automobile Manufacturers, including 14,604 electric vehicles. About 18 million passenger cars were sold in the country last year. Lack of infrastructure is one major reason. China had hoped to have 400,000 charging pillars for electric vehicles in place by next year, but work is behind schedule. State Grid Corp. of China, China's largest power generator by sales, had finished completion of 400 charging stations as of the end of 2013, according to data from the company. Cost is another issue, said Bill Russo, president of automotive consulting firm Synergistics Ltd., who says many electric cars in China are unaffordable there. In China, Tesla sells its Model S for $121,000. "People who buy Teslas are just showing off," he said. Tesla has worked hard to keep its rollout smooth. As of Wednesday it had 72 charging stations in 17 different cities, according to spokeswoman Peggy Yang. The company is working with property developers to install chargers for residents. Still, the lack of infrastructure has caused hitches. In April Tesla said it would delay deliveries to some customers because it worried that they didn't have access to charging stations or to technical support. The frustration led one customer to publicly smash his Tesla's windshield when it was delivered. A video of the incident circulated online.Chief Executive Elon Musk has apologized to customers and said Tesla is working to provide services in more areas. Others are rolling out charging stations and other support facilities including BMW AG, which plans to set up 50 charging stations in Shanghai with local partners as part of a broader future rollout. Earlier this year, a joint venture between China's BYD Co. and Germany's Daimler AG that makes the Denza electric car agreed to tap Switzerland's ABB Ltd. to supply home chargers in the China market. Mr. Zong, 44 years old, is a car aficionado who attributes his environmental consciousness partly to concern for his own health. "When I travel abroad, my asthma subsides. But when I return to China, the coughing and sneezing return," he said. But he's also eager to build his green credentials to boost his business. "My company produces environmentally friendly products. Activities such as donating chargers will help" its image. In addition to Tesla, he also owns a Qin, a plug-in hybrid made by BYD Co.
To start his network, he posted notices on popular social-networking services seeking partners. "I hope to tell people that it might take a much shorter time to build a charging network across China as long as there are more and more participants," said Mr. Zong. To make the charging pillars accessible to more consumers, Mr. Zong didn't choose a direct route between Beijing and Guangzhou. He stretched the journey out to nearly 5,750 kilometers, or about 3,600 miles (from Beijing to Guangzhou), and modified the charging facilities to accommodate other electric cars such as those built by BYD. His trip ran from May 28 to June 18. The charging posts are scattered every 300 kilometers, and more than half of them are placed at or close to four-star hotels. "These hotels have spacious parking lots, sufficient electricity power and can offer 24/7 services. That's attractive to electric car drivers," said Mr. Zong. Tesla now lists some of the sites on its website. The business is attractive to hotel operators because drivers need meals and places to rest, he said, adding a full charge for a Tesla Model S at one of the stations takes seven to eight hours. In addition to building the charging spots, Mr. Zong also ordered another 20 Tesla Model S vehicles as an incentive for his senior management. "If I give them one million yuan, some might take the money and buy cars with great horsepower. That's not in line with the environmentally friendly image I'm building for my company," he said.